Some people may wonder why we have Pepper as our maiden names, if we are Hamiltons? Judy C. of West Virginia and Teresa R. of California, descend from a biological HAMILTON that was “adopted” by a PEPPER family. We (Teresa and Judy) believe that a male HAMILTON was born either circa 1775 in Brookfield, Worcester County, Massachusetts or in 1811 in Palmer, Hampden County, Massachusetts and was given the last name of PEPPER. It is through DNA that we discovered this “problem” which has actually been a pretty amazing journey as we have come to learn about our biological roots through the Hamilton family of Massachusetts. We really care for and appreciate our Hamilton cousins and ancestry now, but as you can imagine it took a bit of getting used to the idea. Our perfect DNA 67/67 marker match to fellow member, Martha Hamilton Hauber, indicates that we share a common Hamilton ancestor with her, which Judy (Pepper) Clark and I have concluded is most likely, Ezra HAMILTON; son of Nathan; son of John, Yeoman of Concord; son of John, Scottish POW. PLEASE NOTE: In all likelihood, it is our direct ancestor, PORTER PEPPER, that was born a HAMILTON but adopted the PEPPER surname for reasons currently unknown to us. He most likely was an illegitimate HAMILTON child. It is through y-DNA (paternal DNA) that we know that he is not biologically related to the PEPPER family through his paternal PEPPER name. He may still very well be a son of a PEPPER daughter, and thus still related to the Pepper’s of Hampshire and Hampden Counties in Massachusetts. 7. Porter PEPPER, (? ), was born on 15 Nov 1811 in Palmer, Hampshire, Massachusetts. He died on 27 Jan 1864 in Brimfield, Hampden, Massachusetts, of “congestion of the lungs”. He married Persis Elvira DEARTH, daughter of Thomas DEARTH and Mehitable BLISS on 21 Jul 1833 in Brimfield, Hampden, Massachusetts. She was born on 29 Jan 1807 in Templeton, Hampshire, Massachusetts. She died on 29 Jun 1870 in Kendall, Illinois. Porter’s birth date is calculated from his age at death on 27 Jan 1864. According to his death record he was 52 years 2 months and 12 days old. That puts the birth date at 15 Nov 1811. We have yet to discover a birth record for him, and that is one of the reasons we suspect he was an illegitimate child and the birth may have been hidden or just kept off the records. “Publishments” (Marriage Intentions) entered by town clerk, F. B. Stebbins 1833: June 30th – Porter PEPPER of Spencer and Persis DEARTH. This is the date of the INTENTION but not the date of the actual marriage, which was 21 Jul 1833. The last record we have for Persis is in the 1870 US Census in Little Rock, Kendall County, Illinois, where she is living in the household of William Wallace and Persis (Pepper) BARTLETT, at the age of 63. Persis (Pepper) Bartlett is her daughter. 8. John Prouty PEPPER, (Porter 7, Hamilton 6, Hamilton 5, Hamilton 4, etc.) was born on 12 Dec 1833 in Brimfield, Hampden County, Massachusetts. He died on 27 Sep 1904 in Rydal, Republic, Kansas, of “tumor of the stomach”. He married Janette STRICKLAND, daughter of John STRICKLAND and Betsey BROOKS on 29 May 1860 in Brimfield, Hampden, Massachusetts. The ceremony was conducted by the Reverend Jason MORSE. She was born on 17 Mar 1839 in Palmer, Hampden, Massachusetts. She died on 3 Apr 1917 in Sidney, Fremont, Iowa. John Prouty PEPPER was the firstborn child of Porter and Persis Elvira (DEARTH) PEPPER. There is speculation that John’s middle name was in honor of Porter and Persis’ soon-to-be-brother-in-law, John PROUTY, of Providence, Rhode Island. The marriage “Intention” record, dated 19 May 1860, indicates that John Prouty PEPPER was of Brimfield, Massachusetts, while Janette STICKLAND was of Palmer, Massachusetts. i. William Henry PEPPER, was born on 14 Apr 1861 in Brimfield, Hampden, Massachusetts. He died on 20 Oct 1925 in Beaver Township, Lincoln, Kansas. He married Ella RIFENBURGH, daughter of Lewis RIFENBURGH and Sarah Jane LUBDELL on 3 Nov 1866 in, Oconto, Wisconsin. She died in 1901 in California. ii. Georgia PEPPER, was born on 22 Oct 1864 in Brimfield, Hampden, Massachusetts. iii. Elizabeth Marie PEPPER, was born on 22 Oct 1865 in Brimfield, Hampden, Massachusetts. She died 27 Aug 1937 in Nebraska City, Otoe, Nebraska, She married Isaac James Buchanan Adams, son of Samuel Adams and Diadama Moore on 12 Dec 1881 in Phillipsburg, Phillips, Kansas. He was born 5 Dec 1859 in Albia, Monroe, Iowa. He died on 23 May 1938 in Nebraska City, Otoe, Nebraska. 9. George Warriner PEPPER (John Prouty 8, Porter 7, unknown Hamilton 6) was born 11 Apr 1872 in Steward, Lee County, Illinois, the second son and sixth child of John Prouty PEPPER and Janette STRICKLAND. It is a bit of a mystery as to why George Warriner was born in STEWARD, Lee County, Illinois, as the family were not living there and never did reside there as far as we know. It makes me wonder if there was a special doctor or midwife there to assist great-great-grandma with the birth. We know that John and Jannette moved from Hampden County, Massachusetts in spring of 1870 and were in the 1870 US Census on August 17th in Delhi, Delaware County, Iowa. There were three daughters born after George, all in Iowa. George is the ONLY one born in Illinois. Steward was a very small brand new community in 1872. He married 22 Aug 1896, in Belleville, Republic County, Kansas, Delia Bridget JACKSON, daughter of Hezekiah Karr JACKSON and Sarah COLLINS. Hezekiah is a descendant of the Fuqua family written about in Fuqua – A Fight For Freedom by Alya Dean Smith Irwin. 10. John Prouty PEPPER, (George Warriner 9, John Prouty 8, Porter 7, unknown Hamilton 6), born 24 January 1908, near Barnard (Sunnyside Neighborhood), Lincoln County, Kansas, son of George Warriner PEPPER and Delia Bridget JACKSON. He was their fifth child and third son. He was named after his grandfather, John Prouty PEPPER. 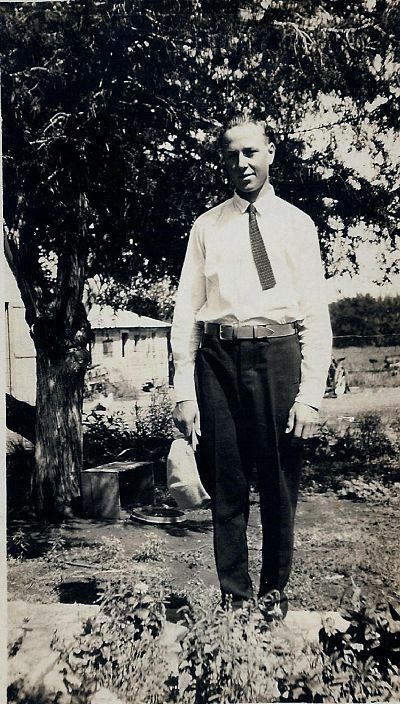 John Prouty Pepper, Early 1920’s, Grandpa told me this was of him in his first pair of long pants. He must have worn knickers before this photo! He married 5 Mar 1930, in Ellsworth, Ellsworth County, Kansas, Reita Geraldine BISHOP, daughter of William Franklin BISHOP and Hattie May BOYER. They had six children between 1932 and 1947, four sons and two daughters. John died on 13 May 2008 in Beloit, Mitchell County, Kansas. He was buried in the family plot in Barnard, Lincoln County, Kansas, near his mother and father.